I’m sorry to have to tell you this, but if you have or ever had a pet fish then it turns out that Ellen DeGeneres hates you. OK, that might be stretching it a tad. But, the comedian and Finding Dory actress has now admitted that she wants viewers to realise that fish are not pets, which is kind of what the sequel is all about. I think that fish should be in the ocean. It’s what this whole sequel is about: It’s about rehabilitation and putting them back in the ocean … And we have to protect our oceans. Hopefully that discussion starts with this film, because we really need to protect that environment. You heard it fish shop owners, Ellen DeGeneres is coming after you in a big way. Here’s the thing though, if you’ve instantly been won over by DeGeneres’ comments and you’re already halfway through putting your fish into plastic bags in order to get them back to the sea, just remember to take them out before you put them into the water. 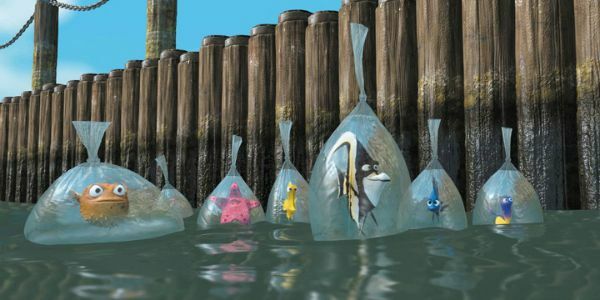 Now, the fact that Willem Dafoe’s Gill and Vicki Lewis’ Deb are in Finding Dory means that they were able to escape from their plastic coffins. Whether the rest of the posse managed to remains up for a serious debate, as their appearances in the films have not yet been confirmed. Even though it’s being released 13 years after its predecessor, Finding Dory will be set just six months after the first film. Dory, who is one of the greatest supporting characters that Pixar has ever created, has now been moved front and centre for the sequel, because alongside Albert Brooks' Marlin and Hayden Rolence’s Nemo she sets off to find her parents. And because Pixar is just so gosh darn perfect, Dory’s mother and father will be voiced by the always magnificent Diane Keaton and Eugene Levy. Plus, the film’s vocal ensemble has also been boosted by the addition of Modern Family’s Ty Burrell and Ed O’Neil, as well as It’s Always Sunny In Philadelphia’s Kaitlin Olson. And if that’s not enough, there will also be a mini Wire reunion as Idris Elba and Dominic West will feature too. Of course, John Ratzenberger, who has voiced a character in every single Pixar film, will also need to appear, otherwise there will probably be a riot at the studio’s headquarters. But that goes without saying. Finding Dory will be with us on June 17, 2016.